AZULIA II, The Premier Caribbean Sailing Yacht Charter. 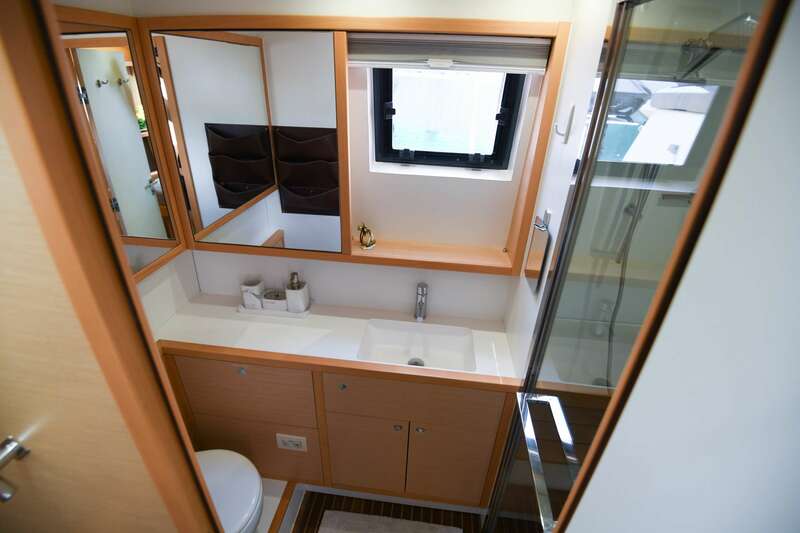 Imagine a fully crewed and catered luxury dream vacation on Azulia, a 2015 Lagoon 560 S2 catamaran. Experience the tranquility and beauty of the Virgin Islands while wrapped in the elegance and prestige of the finest sailing multihull in the Caribbean. 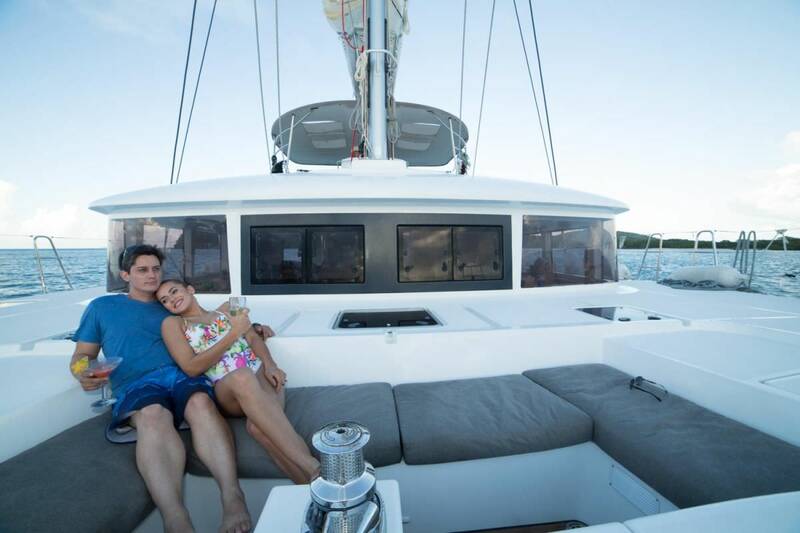 Experience the unspoiled beauty and quality sailing of the Virgin Islands on Azulia II, a premium, fully-equipped Lagoon catamaran available for charter. Excursions depart from the any port in the British Virgin Islands, US Virgin Islands or from eastern Puerto Rico. Explore the beautiful Caribbean while enjoying delectable galley treats aboard beautiful Azulia. 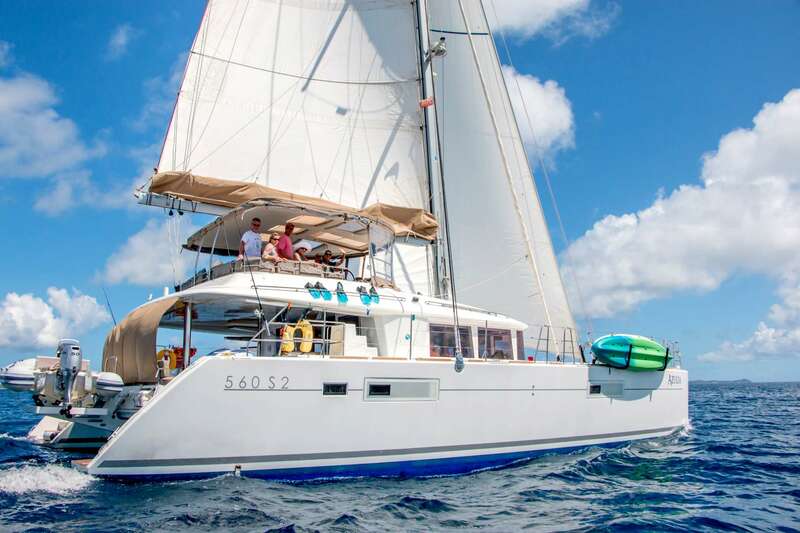 Having been gently chartered and meticulously maintained with the same crew, Azulia is among the finest yacht charters that the Virgin Islands can offer. 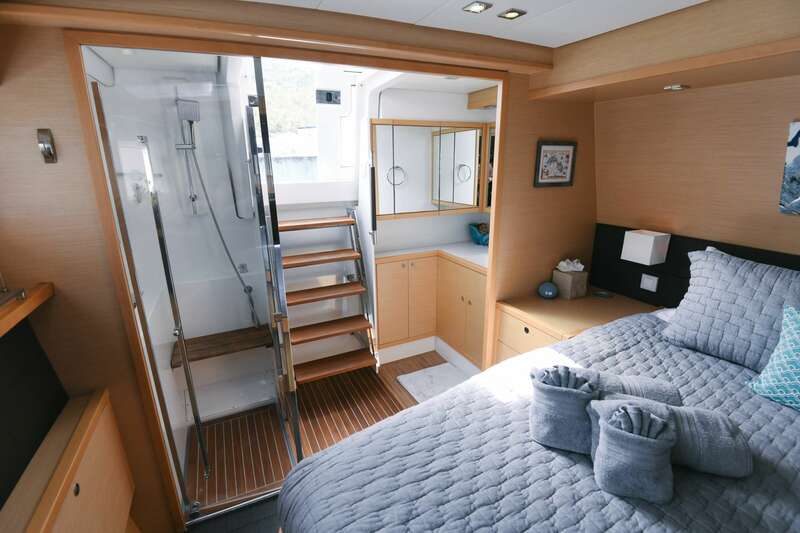 Azulia II accommodates up to 8 guests in 4 elegant queen guest suites, each with its own ensuite head and shower. Cabins are beautifully appointed with luxury bedding and linens. She is air-conditioned throughout with individual controls in each cabin. 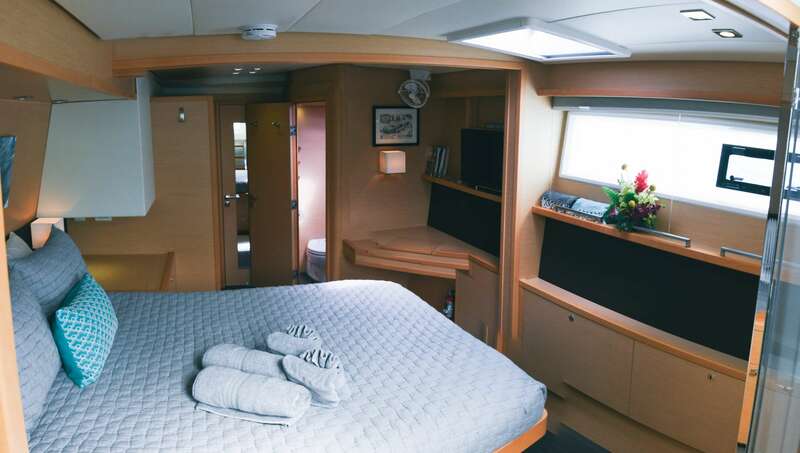 Crew quarters are separate bunk beds, with own head and shower (Crew may switch cabins if 2 bunk beds are desired instead of queen (usually for small children)). Large galley with 5 burner stove and full size oven. Salon dining area. Table expands to seat 8 comfortably. 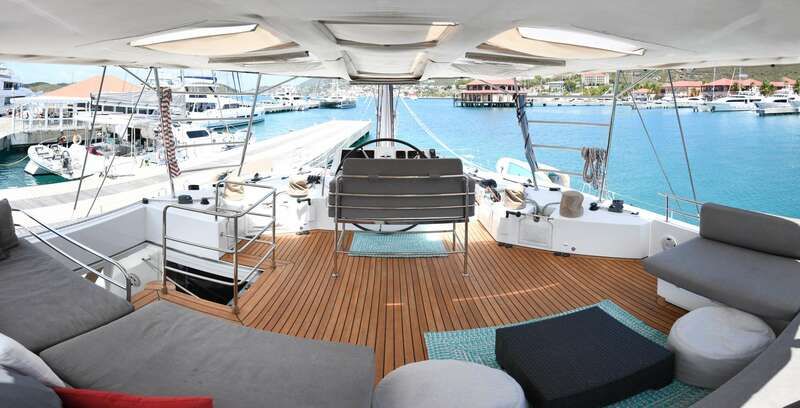 Lagoon 560 AZULIA II can accommodate 8 guests in 4 luxurious cabins plus the crew in the 5th cabin. Four cabins have a Queen size bed and are comfortable outfitted with luxury high thread count bedding and plush towels. The fifth cabin has 2 twin bunk beds. Crew may switch between twin bunks or aft port cabin, depending on guest preferences. All cabins have private showers and toilets. 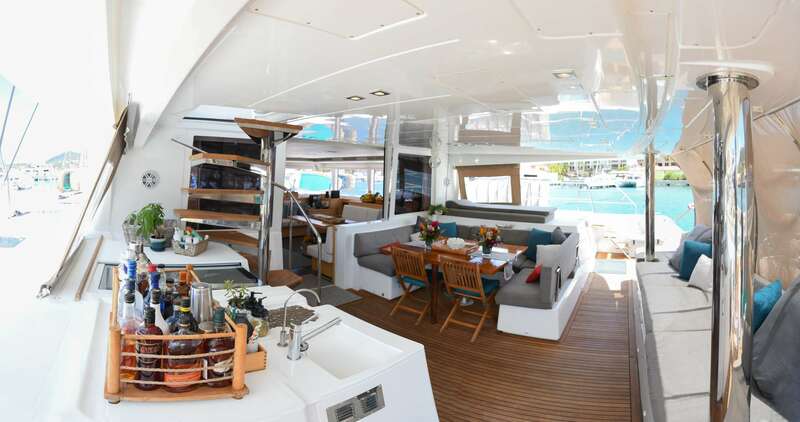 AZULIA is fully air conditioned throughout with individual controls in each cabin. Master bath with outside entry.